"[W]workers in the U.S. business sector worked virtually the same number of hours in 2013 as they had in 1998—approximately 194 billion labor hours. What this means is that there was ultimately no growth at all in the number of hours worked over this 15-year period, despite the fact that the U.S population gained over 40 million people during that time, and despite the fact that there were thousands of new businesses established during that time. And given this lack of growth in labor hours, it is perhaps even more striking that American businesses still managed to produce 42 percent—or $3.5 trillion—more output in 2013 than they had in 1998, even after adjusting for inflation. . . .One thing can be said for certain: the entirety of this additional output growth must have come from productive sources other than the number of labor hours. For example, businesses may increase output growth by investing in faster equipment, hiring more high-skilled and experienced workers, and reducing material waste or equipment downtime. In these and other cases, output may be increased without increasing the number of labor hours used. Gains in output such as these are indicative of growth in labor productivity over a period." A lot can be said about this basic fact pattern. Of course, the comparison years are a bit unfair, because 1998 was near the top of the unsustainably rapid dot-com economic boom, with an unemployment rate around 4.5%, while 2013 is the sluggish aftermath of the Great Recession. The proportion of U.S. adults who either have jobs or are looking for jobs--the "labor force participation rate"--has been declining for a number of reasons: for example, the aging of the population so that more adults are entering retirement, a larger share of young adults pursuing additional education and not working while they do so, a rise in the share of workers receiving disability payments, and the dearth of decent-paying jobs for low-skilled labor. 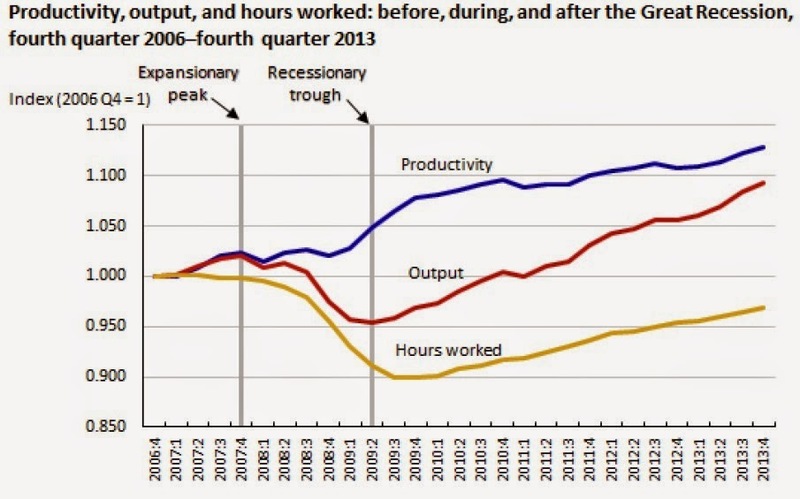 Here's a figure showing the patterns of hours worked, output, and productivity in the aftermath of the Great Recession. Sprague explains: "[A]s the recession began, productivity flattened out as output and hours both fell approximately in concert with one another. Output and hours continued to fall together until the latter part of the recession, when the fall in output ceased but hours continued to decline. During this period there was substantial productivity growth: from the fourth quarter of 2008 through the fourth quarter of 2009, productivity grew 5.6 percent. In fact, this was the highest four-quarter rate of productivity growth recorded in more than 35 years." Here's a figure showing productivity growth rates in the post-World War II era. 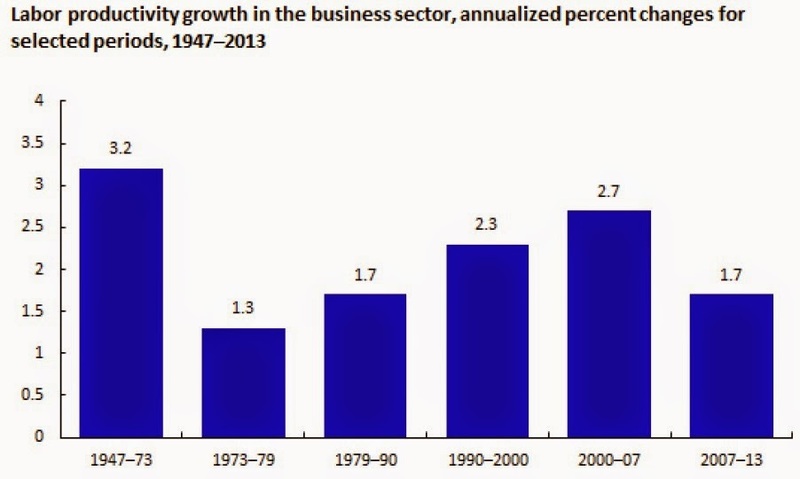 Notice that annual rates of productivity growth were relatively rapid from about 1947-1973 at 3.2% per year. Then there is a dramatic slowdown of productivity growth in the 1970s, and while higher rates follow in the 1990s and more recently, the U.S. economy has failed to return to the more rapid productivity growth of the 1950s and 1960s. As I've noted from time to time in previous posts (for example, here and here), there is no more important question for the long-run health of the U.S. economy than whether a fairly robust rate of productivity growth can be sustained. The more immediate question is what to make of an economy that is growing in size, but not in hours worked, and that is self-evidently having a hard time generating jobs and bringing down the unemployment rates as quickly as desired. I'm still struggling with my own thoughts on this phenomenon. But I keep coming back to the tautology that there will be more good jobs when more potential employers see it as in their best economic interest to start firms, expand firms, and hire employees here in the United States. I have written an essay for the June 2014 issue of Finance and Development on the subject of "Economics and Morality" (51: 2, pp. 34-38). Here are the opening paragraphs, the closing paragraphs, and a couple of snippets in between. Of course, I encourage you to read the whole thing. "Economists prefer to sidestep moral issues. They like to say they study trade-offs and incentives and interactions, leaving value judgments to the political process and society. But moral judgments aren’t willing to sidestep economics. Critiques of the relationship between economics and moral virtue can be grouped under three main headings: To what extent does ordinary economic life hold a capacity for virtue? Is economic analysis overstepping its bounds into zones of behavior that should be preserved from economics? Does the study of economics itself discourage moral behavior? ..."
"Rather than focusing on philosophical abstractions about the moral content of work, consider a prototypical family: parents working, raising some children, friendly with coworkers and neighbors, interacting with extended family, involved with personal interests and their community. It seems haughty and elitist, or perhaps betraying unworldly detachment, to assert that people who work are condemned to live without virtue—unless they can squeeze in a bit of virtuous activity in their spare time. On the other hand, it seems bizarrely and unrealistically high minded to assert that daily work surrounds people every day with transformational opportunities for virtue. A middle ground might be to accept that while moments of grace and opportunities for virtue can occur in all aspects of life, including economic life, the range and variety of opportunities for virtue may vary depending on the characteristics of one’s economic life. ..."
"A standard complaint about studying economics is that the subject is “all about getting money and being rich.” ... Economists can feel unfairly singled out by this complaint. After all, many academic subjects study unsavory aspects of human behavior. Political science, history, psychology, sociology, and literature are often concerned with aggression, obsessiveness, selfishness, and cruelty, not to mention lust, sloth, greed, envy, pride, wrath, and gluttony. But no one seems to fear that students in these other disciplines are on the fast track to becoming sociopaths. Why is economics supposed to be so uniquely corrupting? After all, professional economists run the ideological gamut from far left to far right, which suggests that training in economics is not an ideological straitjacket." great economist Alfred Marshall wrote that “economics is the study of people in the everyday business of life.” Economists cannot banish the importance of moral issues in their field of study and should not seek to do so. But when moral philosophers consider topics that touch on the ordinary business of life, they cannot wish away or banish the importance of economics either." It's common to talk about economic development "in Africa," and I've done so on this blog a few times (for some examples, here, here, here and here). But "Africa" includes 54 countries and 1.1 billion people, so does referring to it as a single unit make any economic sense? In my reading, one of the themes of the African Economic Outlook 2014, recently published by the African Development Bank Group, OECD, and the UN Development Programme, is that thinking about Africa as a whole does make some economic sense. The reason is that in the modern global economy, there are no examples of small stand-alone economies that have achieved a high standard of living. Instead, the high-income countries either have an enormous internal market (the US and Japan, for example) or have close economic ties to a number of other national economies (like the countries of the European Union), or both. If the national economies of Africa are going to build on their real if modest economic progress of the last decade or so, one of the big reasons will probably be that they bolster trade relationships within the countries of Africa, as well as tap into international flows of goods, services, people, and finance. To some extent, this change is already underway. legal architecture for regional integration, poor physical infrastructure and one-way trading relationships. Leading African exporters such as Angola, Algeria, Egypt, Libya, Morocco, Nigeria and South Africa have stronger economic links to the rest of the world than with regional neighbours." As one example of the issues, the 54 nations of Africa are divided into eight somewhat overlapping regional economic groups, all proceeding with various steps of economic integration at different speeds. Here's a figure comparing intra-Africa trade with other trading partners. A common pattern--say, if one looks at the EU or at North America--is that trade volumes are larger with those who are geographically close. But intra-African trade (the black dashed line) is similar trade between African nations and the US, and lags behind Africa's trade with China or especially the EU. Basic steps to encourage intra-African trade are still lacking. It's costly for people to move between countries: "Africans need visas to get into at least two thirds of other African countries." It's hard for goods and services to move, because of missing infrastructure: "While there has been progress in developing regional transport corridors, there are still missing links – which are investment opportunities for African and foreign investors. From the Ethiopia-Djibouti corridor, to Lagos-Abidjan, major road corridor upgrades are needed to link key cities to ports and airports. ... Increasing attention is being given to obstacles such as regulatory bottlenecks, the opaque legal environment and institutional inefficiencies holding up new infrastructure." The economies of Africa are becoming more closely tied to the buying power in the rest of the world economy in various ways. One of the most visible signs is the type and size of financial flows to Africa. The graph shows four kinds of financial flows: remittances sent back to Africa from emigrants working abroad; official development assistance; portfolio investment, which consists of cross-national financial investments that don't involve a management interest and thus can be liquidated very quickly; and foreign direct investment, which consists of cross-national financial investments that do have a management interest. 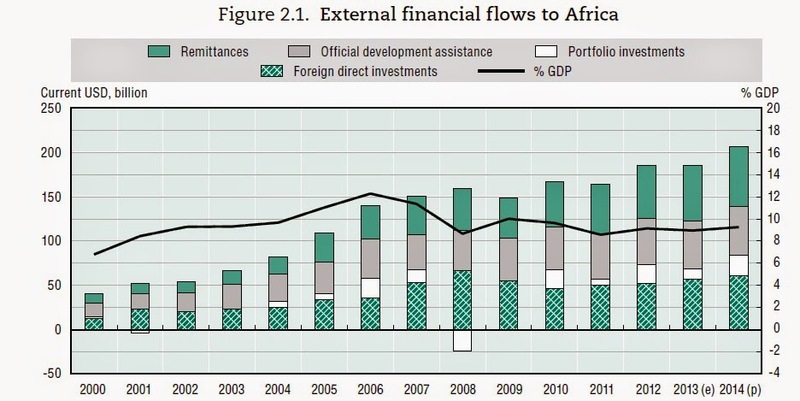 Notice that remittances are now the single biggest category of financial flows into Africa--bigger than foreign aid. Notice also that foreign direct investment, which often involves transfers of management expertise, business connections, and technology as well as financial capital--outstrips portfolio investment. A common question is whether the foreign direct investment into Africa is all about outsiders developing oil and minerals. That's clearly a big part of the picture, but not all of it. 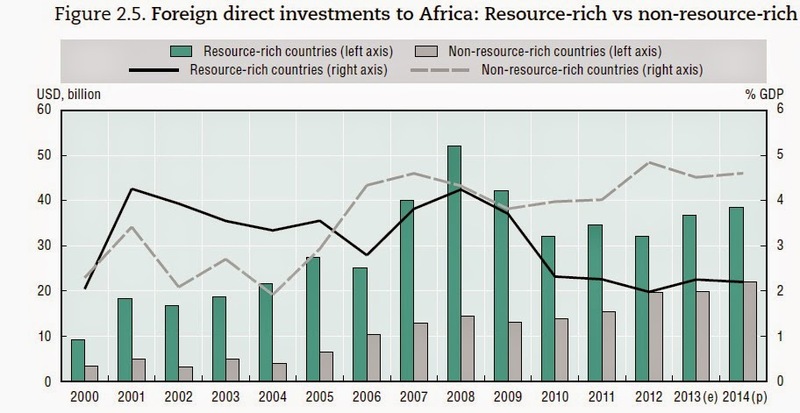 Here's a breakdown of foreign direct investment into African countries that are resource-rich, and those that are not. The absolute amounts of FDI into the resource-rich countries is larger, but the flow to the non-resource-rich is catching up--and is already larger as a share of GDP. The overall effect of these foreign capital inflows is that Africa is able to finance more investment than if it had to depend solely on national saving. 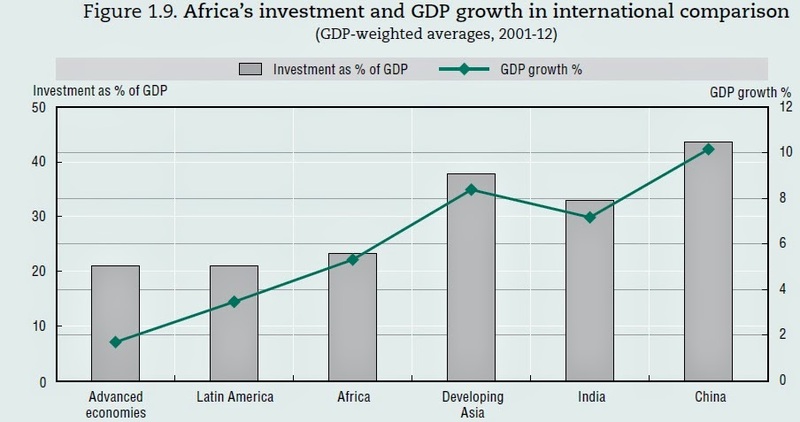 Here's a figure showing that Africa's investment/GDP ratio and its rate of economic growth have outstripped Latin America in recent years, although not reaching the levels of high-growth Asian economies. One of the intriguing possibilities for Africa's economic future is for its economies to become more integrated into "global value chains," in which intermediate inputs to production are produced in a number of different countries. The report devotes a special section and several chapters to this possibility. "In the past, for a country to industrialise it had to develop the domestic capacity to perform all major steps in the value chains of complex manufactured products. Today, through linking into an international production network, countries can establish a specific section of a product’s value chain without having all the upstream capabilities in place. These remain elsewhere and are linked through shipments of intermediate products and communication of the know-how necessary for the specific step in the value chain present in the country. . . . Through participation in a value chain, countries and firms can acquire new capabilities that make it possible to upgrade, i.e. to capture a higher share of the value added in a global value chain. The development experiences of several Asian countries show how industrialisation depends on linkages and on innovations arising from knowledge spillovers. For instance, China integrated into global value chains by specialising in the activities of final product assembly and was capable of upgrading its participation by building a competitive supply base of intermediate goods (developing linkages) and by enhancing the quality of its exports. At the firm level, economic upgrading is defined as “moving up” the value chain into higher-value activities, which theoretically enables firms to capture a higher share of value in the global value chain and enhances competitiveness . . . Many of the factors that hinder economic integration across Africa, or affect economic growth in Africa more broadly, also affect the prospects for Africa's participation in global value chains. Still, there are a few initial promising signs. Some African countries are making a push to be involved in the business outsourcing market: "The global business processing outsourcing market was forecast to grow 5.1% in 2013 and reach USD 304 billion. The race is on among countries such as Egypt, Kenya, Ghana, Mauritius, South Africa, Tunisia and Uganda to become the new “India” in Africa using incentives and special economic zones to develop their outsourcing sectors." "Despite their name, global value chains exhibit high regional concentration, which is shrinking slowly. Africa does not play a significant role yet. When measuring the linkages between major supply-chain traders, the strongest relationships can be found within the regional blocks of East Asia, Europe and North America. About 85% of global value chain (GVC) trade in value added takes place in and around these three hubs. While other regions remain marginal, their share has increased from only 10% in 1995 to 15% in 2011. Africa’s share in GVC participation increased from 1.4% to 2.2% during the same time." So-called "shadow banks" were at nexus of the financial market meltdown that brought on the Great Recession. But what's a "shadow bank" and why does it cause problems? Daniel Sanches offers an overview in "Shadow Banking and the Crisis of 2007-08," in the Business Review of the Federal Reserve Bank of Philadelphia (2014, Q2, pp. 7-14). As a starting point, think about how a plain vanilla ordinary bank functions in the economy, acting as a financial intermediary between savers and borrowers. Here's a schematic taken from Chapter 29 of my Principles of Economics textbook (and of course, I encourage those teaching intro econ next year to check it out.) Savers deposit money in banks. Banks lend those funds to borrowers. Borrowers repay the loans with interest, and the original savers are paid some of that interest, along with having the ability to withdraw their money as desired. But here's the potential problem. Once the money is loaned out, the borrowers are on a schedule to repay gradually over time. However, the original savers want the ability to withdraw their money any time they please. The assets of the bank (the loans it has made) are long-term, while the liabilities of the bank (the money it owes to savers) are potentially very short-term. In the textbook, I call this the "asset-liability time mismatch." Before the enactment of deposit insurance, if the original savers heard that their bank had made a lot of loans that might not pay off, they have an incentive to "run" on the bank, quickly withdrawing their deposits and bringing the bank to its knees. When the government started requiring deposit insurance, it knew that savers no longer had an incentive to monitor whether their bank was behaving prudently, and so the government also installed a system of bank regulation. when depositors begin to worry about losses, a bank run may ensue." As he writes, step 1 is for the bank to make loans. However, in this case the bank does not wish to continue holding or servicing the loans, and so it sets up an SPV, or special purpose vehicle, which purchases the loans from the bank. Next, the special purpose vehicle issues asset-backed securities (ABS), which are just financial securities where the return is determined by the loans that the SPV purchased from the bank. Outside investors can buy these asset-backed securities. There is nothing necessarily wrong with any of this. By selling off the loans to a special purpose vehicle, the bank insulates itself from the risk that loans might go bad. As a result, the bank regulators are pleased. The loans that are sold to the SPV might be home mortgages, or car loans, or money owed to credit card companies, or they might be loans to businesses, like the short-term loans called "commercial paper." Instead, the outside investors in the SPV bear that risk. Imagine, for example, that the outside investor is a large pension fund or insurance company, with long time horizons. The pension fund isn't set up like a bank to make business loans. But by purchasing a portfolio of such loans made through an SPV, the pension fund or insurance company can be well-positioned to bear the risk that some loans won't pay off, as long as on average it receives a solid return over time. But several issues can arise in the new financial structure, as well. One risk is that that when banks know that they are not going to be holding the loans themselves, but rather selling the loans along to an SPV, they are likely to put less time and attention into evaluating the risk of the loans. The loans in an SPV may end up being riskier than expected, and if investors recognize that these risks are high, they will be less willing to invest in certain kinds of SPVs. In turn, if banks face a situation where it's hard for them to re-sell their loans to an SPV, and the banks have decided that they no longer wish to hold loans themselves, then the banks will cut back sharply on making loans in the first place. Part of the credit crunch during the Great Recession was because investors became aware that at least some of the SPVs that included home mortgages were quite risky--but they didn't know which ones. As a result, they became unwilling to invest in any SPVs based on home mortgages for a time. Another issue arises if those investing in the SPV are not an entity like a pension fund, with long-term time horizons and an ability to ride out the bumps in the market, but instead have very short-term time horizons. Imagine that you are running a corporation or a big financial organization like a pension fund, and you need to keep a certain amount of your money in cash, so that you can use it to pay bills and payroll. However, as Sanches points out: "Until 2011, large commercial depositors could not receive interest on their short-term deposits, another motivation for them to seek an alternative place to park their funds." When interest rates were very low, pension funds were searching for options to hold cash that paid a higher interest rate, too. As a place to invest their liquid assets and still earn some return, these institutions turned to what's called the "repo" market, where repo is short for "repurchase." The market works this way. On one side you have parties who hold some financial assets, which could be Treasury bonds or mortgage-backed securities or car-loan-backed securities or something else. These institutions may often be investment banks or broker dealers. These institutions want to borrow some funds, and they offer the securities they hold as collateral. On the other side of the market, you have the big corporations and financial funds that are looking for a place to park their short-term cash and get some interest. The repo market may sound a little peculiar, but it works just fine--as long as the financial assets that are being bought and sold are extremely safe and secure, like U.S. Treasury borrowing. But in the years leading up to the financial crisis in 2007-2008, repo contracts began to be based more and more on other financial instruments, like mortgage-backed securities. In addition, financial funds like money market mutual funds, which are required by law to invest in short-term assets as a way of holding down their risks, began to put a portion of their funds into the very short-term repo markets. "A depositor with serious doubts about the underlying value of the collateral can do two things: either ask for more collateral or simply not renew the repo. Both actions can be interpreted as a decision to withdraw funds from the shadow banking system, much like the decision bank depositors make to withdraw funds from their bank when they believe they might not be able to get all their money out. Repo lenders initially asked for more collateral, but ultimately they simply refused to renew their loans. In other words, the repo market froze Because investors could not tell safe MBS [mortgage-backed securities] from risky MBS in most cases, they withdrew their funds even from shadow banks that probably had safe MBS to secure repos. This problem was severe enough to turn the initial panic into a systemic event — a banking crisis. Thus, the financial crisis was not very different from the banking crises of old. Investors in the repo market behaved pretty much like bank depositors did during U.S. banking crises before 1933. And the outcome was certainly very similar. The initial banking crisis spread to other financial markets, and several financial firms either failed or had to be rescued by the federal government to prevent further failures." In broad terms, one way to think about these issues is that the old model of the plain-vanilla bank, making and holding loans, has been breaking down for some years now. 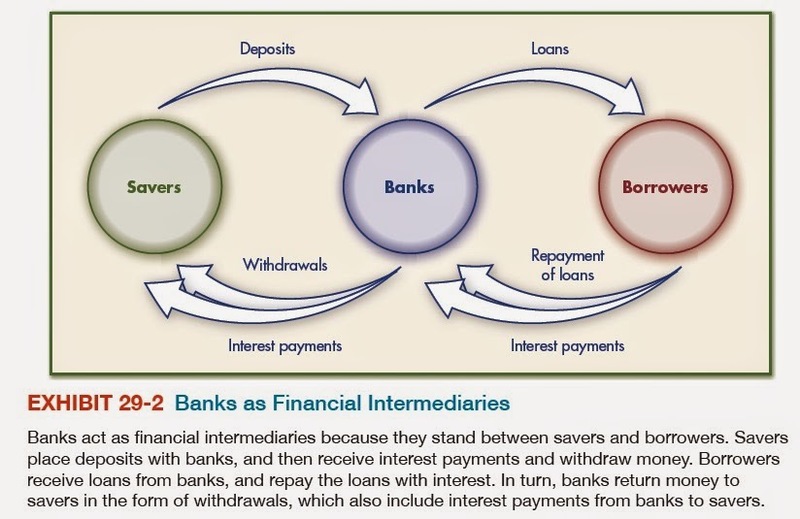 Instead, there is a more complex web of investors in special purpose vehicles, often tied to banks if technically separate from them, who structure their financial transactions to have the overall effect of making deposits, lending, borrowing, and investing, but without having those actions happen in the organizational structure of a conventional bank. The task of creating a new structure of financial regulation to address the new realities is quite incomplete. The implementation of the Dodd-Frank financial reform legislation passed back in 2010 is only about half-completed, and for all the new requirements it seeks to impose, it does essentially nothing to address repo markets or issues of lending and borrowing financial securities. Longer life expectancy is a profound blessing associated with economic development. But it raises questions for the lifetime balance between work years of earning income and retirement years of spending it. James M. Poterba explores the issues in "Retirement Security in an Aging Population," which was delivered as the Richard T. Ely Lecture in January, and has now been published in the May 2014 issue of the American Economic Review: Papers & Proceedings (104:5, pp. 1–30). The AER is not freely available on-line, but many readers will have access through library subscriptions. As a starting point, contemplate the rise in life expectancy for Americans during the 20th century. In 1900, for example, men had a life expectancy of 51.5 years, and less than a 50% chance of reaching age 65. If they reached 65, they had an additional life expectancy of 13.5 years. By 2000, men had a life expectancy at birth of 80 years, and 86.1% of men would reach age 65, when they would have an additional life expectancy of 20.4 years. The difficulty arises, of course, because many people have life profiles of income and consumption that don't match this average. When average retirement is longer, and especially when a portion of that retirement is more likely to be spent in the above-85 age group that is more prone to physical and cognitive limitations, saving for retirement needs to be on average correspondingly larger, too. 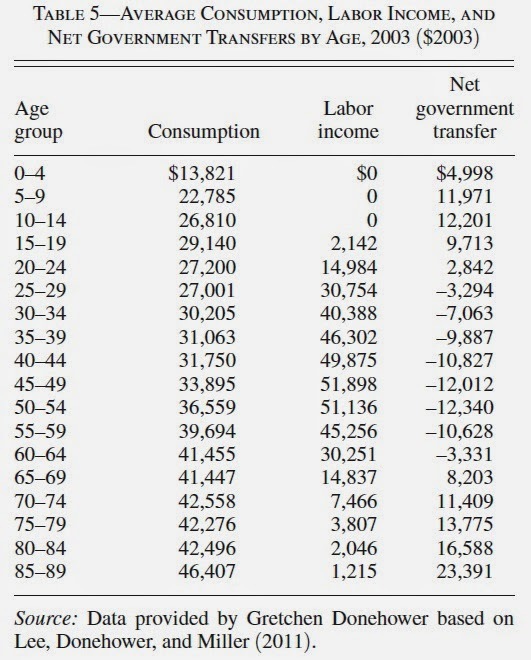 For a sense of the differing results of working and saving over a lifetime, consider this table showing the sources of income for those over age 65. The columns show figures by income "quartile," that is, by dividing the population of elderly by income into quarters. The top panel shows the percentage of people in that income quartile receiving income from a certain source, while the bottom panel shows the amount of income received from that source. One way to think about these patterns is to divide the elderly population into three groups. First consider the lowest income quartile. About three-quarters of this group receives Social Security, and about one-quarter receives some income from other assets. But for this group, 85% of annual income comes from Social Security. Of course, this calculation is based on income, so it doesn't count the value of in-kind benefits like Medicare, Medicaid (which covers nursing care for the low-income elderly) or Food Stamps. Also, at least some of the elderly in this group probably own their home outright, and for that group their out-of-pocket housing expenses may be relatively low. But the hard reality from this data is that something like one-quarter of the elderly will have no financial assets and perhaps no housing assets either at retirement. They will be reliant on Social Security and various public assistance programs. Now consider the upper quartile. Although about three-quarters of this group also receives Social Security, it is not the primary source of income. 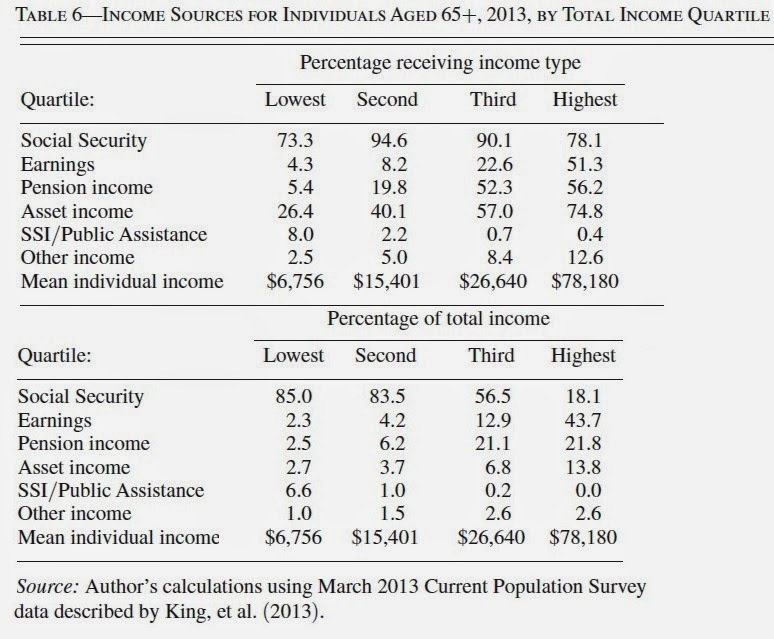 Some of those in this over-65 group have not yet started receiving Social Security income, because half of this top quarter is still earning income, which accounts for 43% of the average income of this group (although this average includes both those who are working and those who are retired). More than half of this group have pension income, and three-quarters have income from other assets. This part of the population is also eligible for Medicare, and a fairly large share probably own their homes outright as well. Together with average income of $78,000, this top quarter of the over-65 population is in essentially good shape for retirement, even a retirement that lasts a few years longer than expected. The third group is those in the middle. Some of this group, especially those in the third quartile rather than the second, are continuing to work and earn income, and a substantial share have some pension income. Still, Social Security accounts for 83% of the income of the second quartile (almost as high as for the first quarter) and well over half of average income in the third quartile. Average annual income for these groups is $15,400 for those in the second quartile and $26,600 for those in the third quartile, which with some mixture of Medicare, public assistance programs, family support, and maybe owning a house can be enough to scrape by. This is a group where public policy that provides incentives for additional saving in a retirement account while working, or working a few more years before retirement, might make a considerable difference. Just to complicate the comparisons across these groups a little more, growth in life expectancy is not evenly distributed across income groups. 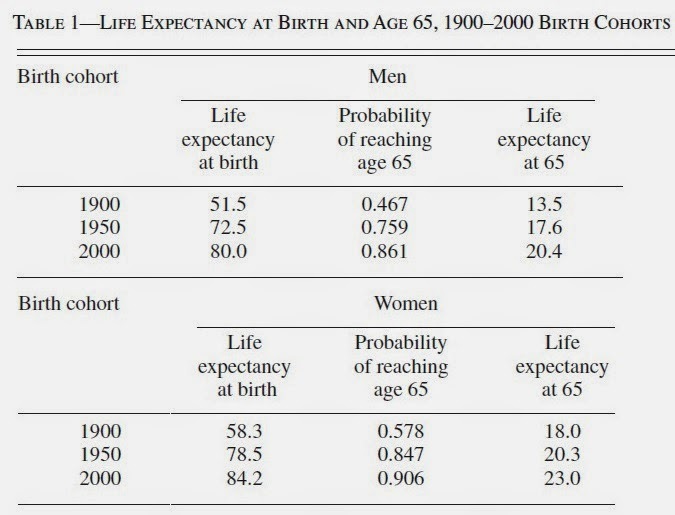 For example, here are some illustrative statistics showing that for those born in 1912 (and thus those would have turned 65 in 1977), life expectancy for those who reached age 65 and those who reached age 85 was roughly the same. But a gap began to open up. For those born in 1941 (and thus turning 65 in 2006), at age 64 the life expectancy of the top half of earners at age 65 was a full five years longer than for the bottom half of earners. 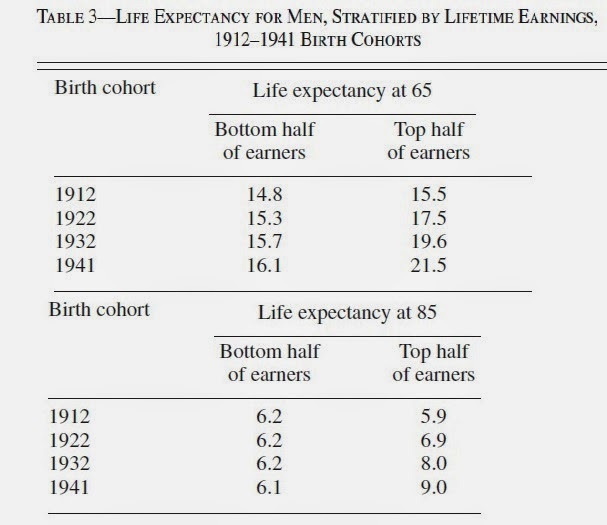 At age 85, life expectancy for the top half of earners born in 1941 was about 3 years longer than for the bottom half--and life expectancy at age 85 for the bottom half of earners did not improve for those born in 1941 over those born in 1912. The reasons for this gap in life expectancy gains across income levels is not entirely clear, but it has to do with the tangle of linkages between greater educational attainment, better health status, and higher income earned. The options for addressing the retirement financing challenge posed by longer lives is straightforward enough. For the lowest-income groups, we will need additional public support. For the middle-income groups, we need incentives for greater saving during working life, and incentives for working a few more years before retirement. The high-income group is already largely looking after itself, often by working a few more years before retirement. How much should you be saving for retirement? Poterba offers some eye-opening illustrative calculations. He looks at a typical path of income over time, and then asks, if at age 65 you want to buy an annuity that will provide amount equal to half of your age-65 income for the rest of your life, what share of income should you be saving? He does the calculations separately for men and women, in parat because different life expectancies. He considers several different "real" rates of return (that is, the rate of return above inflation). He looks at whether you save for 40 year, 30 years, or 20 years. And he looks at whether you want an annuity that will pay a fixed nominal amount, or one that will increase its payments by 3% per year, to offset any increases in the cost of living. 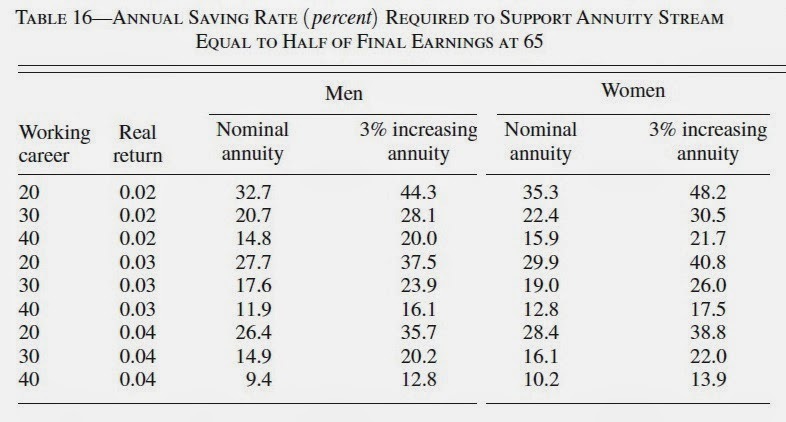 As one example of the bottom line, say that you are a man who will save for 30 years and get a 3% real return.You want to buy the annuity that starts off at half your age 65 income, and then increases 3% per year. Then over those 30 years, you need to be saving 23.9% of your income each year. The average personal saving rate for Americans--that is, saving divided by after-tax income--has been about 5% in recent years. In short, many Americans are not saving nearly enough, including many who have the income level that if it was a priority, they could manage to put more aside. Some Americans already know that they aren't going to have much income in retirement, but I suspect that in the next decade or so, many more Americans are going to reach retirement and feel surprise and disgruntlement over the low level of income they are facing. Each year the Federal Trade Commission and and the Department of Justice Antitrust Division publish the Hart-Scott-Rodino Annual Report, which offers an overview of merger and acquisition activity and antitrust enforcement during the previous year. The Hart-Scott-Rodino legislation requires that all mergers and acquisitions above a certain size--now set at $75.9 million--be reported to the antitrust authorities before they occur. This reporting thus offers an overview of merger activity in the United States. Basically, the story is that the number of mergers and acquisitions has rebounded from the lows of the Great Recession, but the total for 2013 was pretty average. Some press sources, like the Economist magazine, are chirping about the possibility of a new wave of mergers and acquisitions right around the corner. They have been making that prediction for a couple of years now, and sooner or later it will be correct. The report also shows the size distribution of mergers. Remember that the very small number of mergers under $50 million is not because such mergers don't occur, but because the smaller mergers need not be reported to the antitrust authorities. Out of all the proposed mergers, typically about 3-4% lead to a request from the antitrust authorities for more information, and ultimately a few dozen of the mergers are challenged. This percentage may seem low. But remember that firms who know that the antitrust authorities are looking are less likely to propose an anticompetitive merger in the first place. And remember further that the job of the antitrust authorities is not to make judgments about whether the merger makes sense from a business point of view, or whether the price is a fair one, but only to judge whether it might lead to anticompetitive outcomes. The report also offers quick overviews of the more prominent antitrust enforcement actions over the last year. For teachers of economics looking for a quick example, here are two good examples, with links to the underlying case documents. In both cases, the antitrust authorities allowed a merger to proceed only after the firm agreed to divest various assets in a way that was intended to preserve competition. related facilities at each of five airports: Boston Logan, Chicago O’Hare, Dallas Love Field, Los Angeles International, and Miami International. These divestitures are the largest ever in an airline merger and will allow low cost carriers to fly more direct and connecting flights throughout the country in competition with the legacy carriers. This will result in more choices and more competitive airfares for consumers. The court entered the consent decree on April 25, 2014.
if ABI were allowed to acquire all of the remaining Modelo assets required to compete in the United States, as the transaction was originally proposed. ABI and MillerCoors, the two largest beer brewers in the United States, account for more than 65% of beer sold in the United States. Modelo is the third largest beer brewer, constituting approximately 7% of national sales, and in certain MSAs its market share approaches 20%. Heineken and hundreds of smaller fringe competitors comprise the remainder of the beer market. In the 26 MSAs alleged in the Complaint, ABI and Modelo control an even larger share of the market, creating a presumption under the Clayton Act that the merger of the two firms would result in harm to competition in those markets. interest in Grupo Modelo that ABI did not already own. According to the complaint filed on January 31, 2013, as originally proposed, the $20.1 billion transaction would have substantially lessened competition in the market for beer in the United States as a whole and in 26 metropolitan areas across the United States, resulting in consumers paying more for beer and diminished innovation. ABI’s Bud Light is the best selling beer in the United States, and Modelo’s Corona Extra is the best selling import. On April 19, 2013, a consent decree was filed settling the suit and requiring Modelo and ABI to make divestitures that would fully replace Modelo as a competitor in the United States. The decree called for the divestiture of Modelo’s entire U.S. business including perpetual and exclusive licenses of Modelo brand beers for distribution and sale in the United States, its most advanced brewery, Piedras Negras, and its interest in Crown Imports, LLC (Crown) to Constellation Brands, Inc. (Constellation) or an alternative purchaser. Crown was the joint venture established by Modelo and Constellation to import, market, and sell certain Modelo beers into the United States. The decree was entered by the court on October 24, 2013. 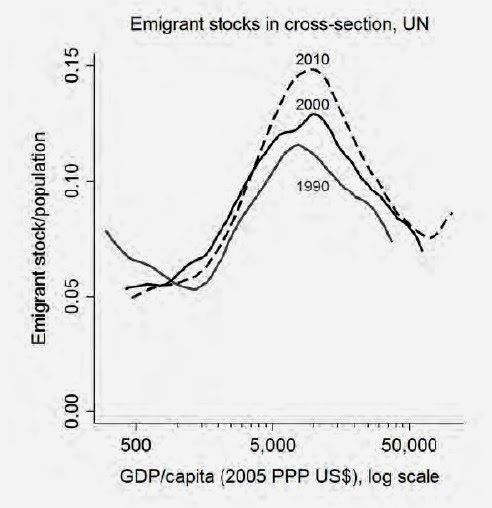 Does Growth Reduce Emigration from Low-Income Countries? One of the standard arguments as to why the U.S. and other high-income countries should support trade with low-income countries and foreign aid to those countries is that it would reduce the pressures for emigrants to leave those countries. For example, during the arguments over the North American Free Trade Agreement (NAFTA) between the United States, Canada, and Mexico, it was common to hear supporters argue that if the U.S. wasn't willing to import goods from Mexico, it would end up importing immigrants instead. Similar arguments have been made that western European countries should support trade and aid to Africa and Asia, so that pressure for immigration flows to Europe would be reduced. "In short, the best-available data show an unmistakable inverted-U pattern across countries in the relationship between overall economic development and emigration. The data offer no sign that among low-income or lower-middle-income countries, rising incomes are associated with smaller emigrant stocks or lower net emigration rates. To the contrary, typical countries in this group show a positive, significant association between average incomes and emigration. The relationship changes markedly somewhere around PPP$6,000–8,000. Among countries above this level of income—upper-middle-income countries or richer—higher incomes are associated with reduced emigration. But even the very richest countries do not systematically exhibit lower emigration rates than the poorest countries." Here's one of the pieces of evidence behind that claim. The graph is based on plotting data by country. The horizontal axis shows per capita GDP for each country; the vertical axis shows the percentage of the population of that country which has emigrated. The graph shows curves fitted through this data for 1990, 2000, and 2010. The common pattern is that emigration is lower for the lowest-income and highest-income countries, and higher for middle-income countries. Why might this pattern hold true? Clemens considers a range of possibilities. For example, people in the poorest countries may be less likely to have the resources to emigrate. Perhaps people in middle-income countries are more likely to have some level of connectedness to high-income countries that makes migration seem more thinkable and less risky. But as researchers seek to disentangle the underlying rationale behind the migration transition, the assumption that economic development in low-income countries will reduce migration doesn't seem likely to hold up well. After all, economic development in China and India in recent decades doesn't seem to have reduced emigration from those countries--even if a number of those emigrants eventually head back to their home countries. At least for the next few decades, the future of the globalizing economy may also be a future of ever-evolving pressures for rising migration levels. Here's a graph showing gasoline prices in countries around the world, on the horizontal axis, and gasoline consumption per year, per person, on the vertical axis. The size of the circle for each country is proportional to total consumption of gasoline in that country. Thus, for example, the U.S., Canada, and Kuwait are roughly similar in their per capital consumption of gasoline, but because of the much larger population of the United States, the circle denoting U.S. consumption is larger. Similarly, although per capital consumption of gasoline is much lower in India and China than in the United States, the much larger populations of those countries mean that total consumption of gasoline is larger--as shown by the size of the circles for those countries. Of course, many factors will affect fuel consumption in an economy besides the after-tax price: fro example, countries with higher per capita GDP tend to consume more fuel, and countries that are large and sprawling will tend to consume more fuel for transportation than smaller countries where more people live in urban areas. Still, a couple of themes from this graph catch my eye. 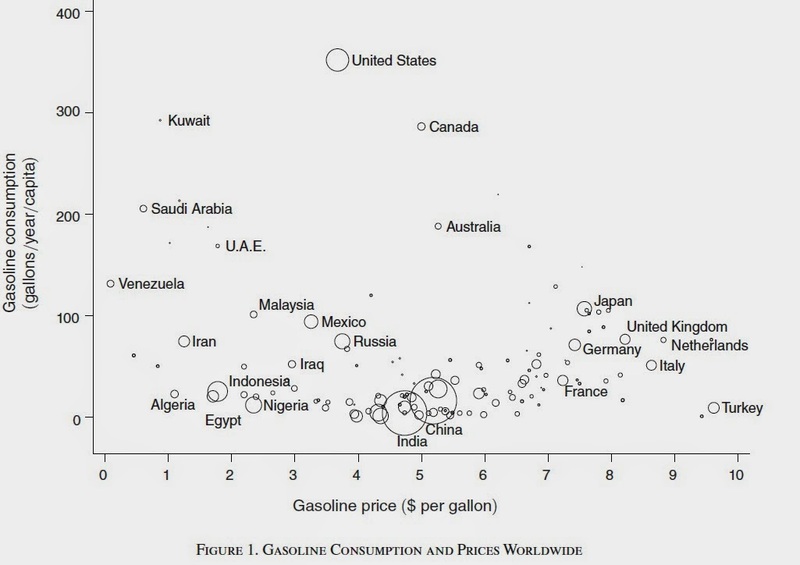 1) The price of gasoline in the U.S. is well below that many other high-income countries. That isn't the only reason the U.S. consumes so much more fuel on a per capita basis--as a high-income and geographically sprawling country, one would expect U.S. fuel consumption to be higher--but it's one of the reasons. The higher taxes on gasoline are part of a general pattern where the governments of most high-income countries rely more heavily on consumption taxes, including value-added taxes as well as taxes on specific goods like gasoline, than does the U.S. government. 2) Venezuela has the lowest fuel prices of any country: indeed, their prices are well below the actual world market price. Presumably, the political leadership in Venezuela believes that its political base supports this policy--and this belief may well be correct. But subsidizing fuel has a cost, which in Venezuela's case is about $14 billion out of a GDP of $380 billion--that is, almost 4% of GDP in Venezuela goes to fuel subsidies. For comparison, the U.S. defense budget is projected to be 3.6% of GDP this year. When Venezuela spends, in proportional terms, the amount of the U.S. defense budget on fuel subsidies, it give up the possibility of spending those funds on health care, education, income support, and so on. Indeed, the bulk of fuel subsidies don't go to the poor--who don't have enough income to buy a lot of fuel at any price--but instead go to those with middle- and upper-level incomes. on health, education, and other key components of government spending." 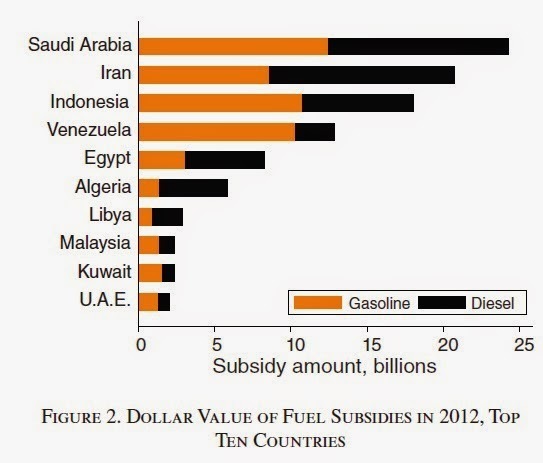 4) Not all major oil exporters subsidize fuel. As Davis writes: "Prices are at or above market in Iraq ($2.95 per gallon for gasoline), Mexico ($3.26), Russia ($3.74), and Canada ($5.00)." "I would like to sound one note of warning. Penicillin is to all intents and purposes non-poisonous so there is no need to worry about giving an overdose and poisoning the patient. There may be a danger, though, in underdosage. It is not difficult to make microbes resistant to penicillin in the laboratory by exposing them to concentrations not sufficient to kill them, and the same thing has occasionally happened in the body. The time may come when penicillin can be bought by anyone in the shops. Then there is the danger that the ignorant man may easily underdose himself and by exposing his microbes to non-lethal quantities of the drug make them resistant. Here is a hypothetical illustration. Mr. X. has a sore throat. He buys some penicillin and gives himself, not enough to kill the streptococci but enough to educate them to resist penicillin. He then infects his wife. Mrs. X gets pneumonia and is treated with penicillin. As the streptococci are now resistant to penicillin the treatment fails. Mrs. X dies." As it turns out, the issue is not that that antibiotics "can be bought by anyone in the shops," but instead that health care providers have been quick to prescribe antibiotics, repeatedly and for a wide range of conditions. Inevitably, not everyone takes the full dose, and in some cases the full dose doesn't quite end the infection. Some microbes become increasingly resistant to antibiotics. As economists have pointed out, this pattern is logically parallel to the issue of what can happen with the overuse of a shared public resource, the so-called "tragedy of the commons." Imagine a shared public resource like a common field where people can graze cattle. If there are too many cattle on the field, it will degrade the environment and everyone will suffer. However, each individual has an incentive to graze just a few more cattle on the field, because the individual will receive 100% of the benefits from adding a few cattle, while the costs of environmental degradation will be shared with everyone else who uses the field. Unless some social norms or rules prevent the outcome, overgrazing will result. Of course, the same logic can be applied to overfishing, overlogging, and indeed more broadly to issues like air and water pollution. In the case of antibiotic resistance, health care providers who prescribing antibiotics frequently and easily are seeking to benefit each individual patient, while the costs of accumulating resistance to antibiotics are shared across the population. In this way, the pursuit of health for individual way, resistance to antibiotics builds in a way that can impose heavy costs. an apocalyptic fantasy, is instead a very real possibility for the 21st century." So says the World Health Organization in its recent report: "Antimicrobial Resistance: Global Report on surveillance." "For several decades antimicrobial resistance (AMR) has been a growing threat to the effective treatment of an ever-increasing range of infections caused by bacteria, parasites, viruses and fungi. AMR results in reduced efficacy of antibacterial, antiparasitic, antiviral and antifungal drugs, making the treatment of patients difficult, costly, or even impossible. . . . Antibacterial resistance (ABR) involves bacteria that cause many common and life-threatening infections acquired in hospitals and in the community, for which treatment is becoming difficult, or in some cases impossible. . . . Some estimates of the economic effects of AMR have been attempted, and the findings are disturbing. For example, the yearly cost to the US health system alone has been estimated at US $21 to $34 billion dollars, accompanied by more than 8 million additional days in hospital. Because AMR has effects far beyond the health sector, it was projected, nearly 10 years ago, to cause a fall in real gross domestic product (GDP) of 0.4% to 1.6%, which translates into many billions of today’s dollars globally. What are the possible solutions? One possibility is to invent our way out of the problem with new groups of antibiotics. The WHO report documents a "discovery void" in new groups of antibiotic drugs in the last quarter-century. 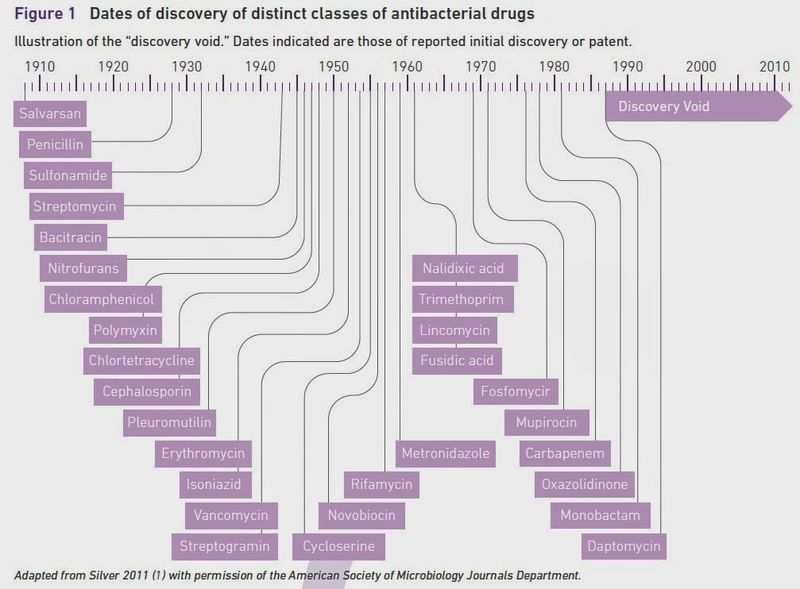 Perhaps some of this "discovery void" can be linked to a lack of economic incentives to discover new groups of antibiotics. But my understanding from a few researchers in this area is that it has been proving genuinely hard to find new classes of antibiotics. And even if a scientific discovery that could lead to new classes of antibiotics is made tomorrow, there would be years of health and safety testing ahead before it reached the health care market. The other options all come down to ways to avoid overprescribing antibiotics--so that when they are really needed, they will still work. In too many places, antibiotics are prescribed for all sorts of conditions where they aren't going to be effective (like in response to viruses). In too many places, many steps could be taken to cut down on the risk of infections through basic steps like more hand-washing and sterilization, which would reduce the need to prescribe antibiotics. Steps like these need to be undertaking with some urgency, so that current antibiotics can keep working while we hunt for new ones. Slonim, Wang, and Garbarino point out that a volunteer blood system can have problems in adjusting to fluctuations in demand for blood. For example, in the aftermath of disasters like the terrorist attacks of 9/11 or Hurricane Katrina in 2005, blood donations spike up. However, these events didn't actually lead to a large demand for blood, and since blood has a limited shelf life, a substantial share of these donations ended up being destroyed. On the other side, there are predictable seasonal fluctuations in demand for blood, like shortages in winter and around holidays. They have some sensible suggestions,within the context of a volunteer blood system, about how one might mobilize irregular donors of blood to address such fluctuations. For me, the most intriguing questions concern the issue of whether the blood supply should be paid or volunteer. Of course, the issue only affects donors of blood--everyone else in the health care system is expecting to be paid when they store and use this valuable health product. Slonim, Wang, and Garbarino write (citations and footnotes omitted): "Even with a largely voluntary supply of blood, the blood industry can be regarded as a multibillion–dollar market because hospitals pay for blood products and charge patients for their use. For example, the cost of the components of each unit of blood sold to hospitals in the United States is approximately $570, with the cost for red blood cells at $229, platelets at $300, and plasma at $40. Hospitals transfuse this blood at estimated costs of between $522 and $1,183 per unit in the United States and Europe." The question of whether a country relies on volunteer or paid blood supply is in part an historical accident, often relating to how blood systems evolved in the decades after World War II. 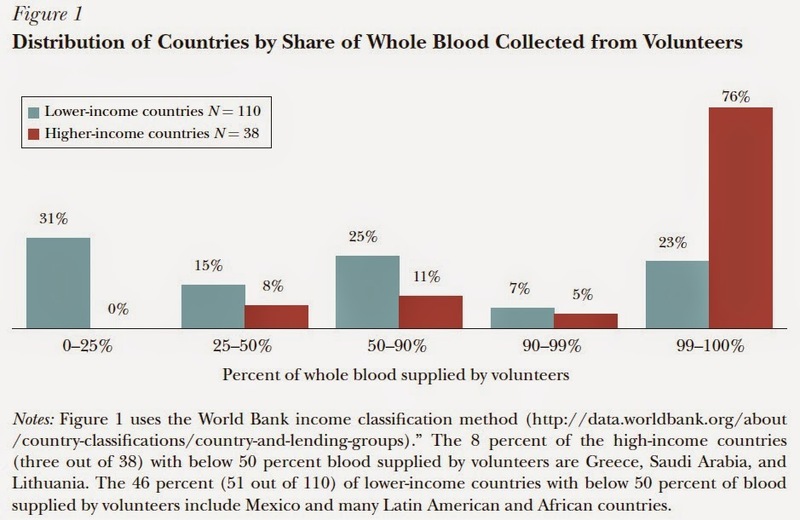 Volunteer blood donation is more common in high-income countries, but many countries in Latin America rely on paid blood donors. In the past, it may have been true that blood from paid donors was less likely to be safe, but given modern techniques for screening blood (and plasma), this pattern no longer seems to be true. Looking at the evidence across countries, Slonim, Wang, and Garbarino state: Thus, while volunteer and nonvolunteer donor characteristics may differ, on the critical issue of blood safety, we find no evidence that countries with higher percentages of volunteer donors provide safer blood." 100 percent volunteer plasma supply, by 2004, 81 percent of US plasma supply was collected from paid donors. In 2004, the United States collected almost 70 percent of the world’s plasma, with 40 percent eventually used in North America, 32 percent used in Europe, and 19 percent used in Asia." However, it is impossible to say how well the volunteer [blood donor] system has performed in an absolute perspective; for example, it is possible that if the blood supply was to increase via a market mechanism that priced blood to its marginal value, then healthcare providers would find innovative uses for it such as the recent trials on the use of plasma derivatives to treat Alzheimer’s. In other words, volunteer supply may meet current demand because the health industry is not aggressively pursuing research and development that might lead to greater demand for blood that they recognize the volunteer system cannot supply. The volunteer system, however, has not done well in meeting plasma demand. The United States is the only country that is totally self-sufficient in all blood and plasma products and has accomplished this using a mostly for-profit plasma industry. Most other countries have to import at least some plasma products, with the single biggest importers being Germany, Austria, and Spain. Many countries remain unwilling to pay for plasma donations due to concerns regarding safety and ethics, which may explain the dramatically different usage rates for plasma products. For instance, in 2006 the US health care system used 105 grams per/1,000 people of the dominant plasma product (immunoglobulin) which was more than 250 percent of the rate in Italy, the United Kingdom, Germany, the Netherlands, and Japan, suggesting that the noncompensated plasma collection system might be limiting potential usage in many countries. Making a transition from a volunteer blood supply to more of a paid blood supply seems to me fraught with practical difficulties. Disrupting the established methods of blood supply should not be done lightly. But it also seems to me that the issues here are neither about the safety of blood from paid donors, given the capabilities of modern blood testing, nor are the issues about the risk of exploiting paid blood donors, given that such arguments would apply equally well to the already widespread practice of paying plasma donors. The real issues should be about the practicalities of making such a change to more paid blood donation, at least in a partial way, and about the potential costs and benefits from such a transition. Every two years the Council on Economic Education publishes "Survey of the States: Economic and Personal Finance Education in our Nation’s Schools." With two high-schoolers and a middle-schooler in my own family, I'm well aware that class-time is tight, and it is impractical to just keep adding subjects and material. Also, I have some qualms about how economics is sometimes taught at the high school level as a sort of watered-down intro college course, rather than as a subject with practical skills and lessons for everyday life as a consumer, worker, borrower and saver, insurance purchaser, manager, citizen, and voter. But it also seems to me that high school students face some genuine financial dangers in this world of credit cards and payday loans, rental agreements and lease-to-buy deals, choices among insurance policies with different deductibles, student loans and car loans--and these dangers that can seriously undermine their financial start as young adults. Thus, I do think it's worth finding some ways to squeeze in some additional learning about economics and financial health. What are the US states generally up to along these lines? One eye-opener in the CEE report is that the question of whether a state "requires" economics in the curriculum often does not have a yes-or-no answer. Instead, the answer can be thought of as a set of questions: Does the state include economics in its standards? Is there a requirement that the standards be implemented? (Apparently, a "standard" and whether the standard is implemented are separate decisions!) Is there a requirement to offer a specific high school course? Is there a requirement that students take that high school course? Is there required testing of economic concepts? Here's a table showing the trends in these categories since 1998. Economics is included in more standards, even in standards that are required to be implemented. However, fewer than half the states require offering a high school course in economics, or require that the course be taken by students. What are the similar factors on the personal finance dimension? There was a huge jump in adding personal finance material to school standards from 1998 to 2000, and the requirements to implement these standards have grown over time. However, relatively few states require offering or taking a course in this area, and there is little testing of these topics. My children joke about having yet another lecture on the perils of drugs, alcohol, and smoking, or about the need to stand up to bullies. Those subjects are worth addressing. But my suspicion is that many high school students will suffer from severe episodes of poor financial health in the 5-10 years after they leave high school--and that the prevalence of such episodes could be reduced with improved high school education in this area. The teeth-whitening industry has seen substantial growth in recent years, which raises this question: Should it be illegal for someone other than a dentist to do teeth-whitening? And do dentists as a group get to make this decision? Since 1989, peroxide-based teeth whitening has become one of the most popular cosmetic dental services. Teeth whitening is available as an in-office treatment, or take-home kits, by dentists; as over-the-counter products; and at salons, malls, and other convenient locations by non-dentists. Although all these methods employ peroxide, they vary in important respects, including immediacy of results, ease of use, necessity of repeated application, need for technical or professional support, and price. Thus, while dentists’ “chair-side” services are quick and effective—usually providing results in a single visit—they are also “the most costly” alternative. At the other end of the spectrum, over-the-counter products, with relatively low concentrations of peroxide, are the least expensive, but with highly variable efficacy, as they require diligent and repeated application by consumers. Growing demand for teeth whitening services led, around 2003, to the entry of non-dentist providers. These providers generally occupy an intermediate level—in terms of cost, convenience, and efficacy—between dentists’ chair-side services and over-the-counter products. They utilize intermediate-concentration peroxide, in a single, consumer-administered application, lasting an hour or less. Non-dentist services are often offered at prices hundreds of dollars less than dentists’ in-office services. As competition from non-dentists mounted, North Carolina dentists demanded that the Board “do something” about the new market entrants. It consists of six licensed dentists, elected directly by other state licensed dentists; one licensed dental hygienist, elected by other licensed hygienists; and one consumer member, appointed by the governor. The six dentist-members must also be active practitioners while on the Board; thus, they provide for-profit dental services (some including teeth whitening), and have a significant financial interest in the business of their profession. Unsurprisingly, this group decided that non-dentists should be barred from offering teeth-whitening services. These decisions about what only certain licensed practitioners are allowed to provide are typically not challenged by the antitrust authorities, so it was somewhat surprising that the FTC challenged this practice, and that the decision was upheld by the U.S. Fourth Circuit Court of Appeals. The case has now reached the the U.S. Supreme Court. Once limited to a few learned professions, licensing is now required for over 800 occupations. And once limited to minimum educational requirements and entry exams, licensing board restrictions are now a vast, complex web of anticompetitive rules and regulations. . . . State-level occupational licensing is on the rise. In fact, it has eclipsed unionization as the dominant organizing force of the U.S. labor market. While unions once claimed 30% of the country’s working population, that figure has since shrunk to below 15%. Over the same period of time, the number of workers subject to state-level licensing requirements has doubled; today, 29% of the U.S. workforce is licensed and 6% is certified by the government. The trend has important ramifications. Conservative estimates suggest that licensing raises consumer prices by 15%. There is also evidence that professional licensing increases the wealth gap; it tends to raise the wages of those already in high-income occupations while harming low-income consumers who cannot afford the inflated prices. "Where licensing was once reserved for lawyers, doctors, and other “learned professionals,” now floral designers, fortune tellers, and taxidermists are among the jobs that, at least in some states, require licensing. ... In Louisiana, for example, all flower arranging must be supervised by a licensed florist. . . . Minnesota (along with several other states) now defines the filing of horse teeth as the practice of veterinary medicine, a move that has redefined an old vocation as a regulated profession subject to restricted entry and practice rules. . . .Several states even prohibit the sale of caskets by anyone other than licensed funeral directors. . . . And although Louisiana restricts the sale of caskets, it does not regulate the design of caskets or even require that bodies be buried in a casket at all. . . .
Nurse practitioners and physician assistants are trained in some of the same skills as family practice physicians but need not learn the more advanced skills essential to obtaining a medical degree. . . . For many procedures, outcome studies reveal that the extenders’ services are as safe and effective as that of physicians. Extenders have been essential to low-cost convenience clinics like CVS’s MinuteClinics and public health initiatives aimed at serving low-income individuals with restricted access to medical care. Undoubtedly influenced by powerful lobbying from the American Medical Association (AMA), twelve states (including more populous states such as California, Texas, and Florida) require physician supervision over all nurse practitioner activity. Several states prohibit nurse practitioners from prescribing medication. . . . In addition, many states define title certification and abstraction as the “practice of law,” which effectively inflates demand for legal services by requiring attorney representation at all real estate transactions. Other "recent additions to the list of professions requiring licenses include locksmiths, beekeepers, auctioneers, interior designers, fortune tellers, tour guides, and shampooers." Of course, the standard argument in favor of occupational licensing is that it protects consumers by assuring that they will receive higher-quality services. In many cases, this argument seems very unlikely to be true. For example, there didn't seem to be any evidence that the non-dentist teeth whitening services in North Carolina were ineffective or harmful to consumers. Consumers wouldn't seem to be at any particular health or safety risk from unlicensed flower arrangers. And if you don't like the service provided by a hair-braider or an interior designer, well, just like if you don't like a certain restaurant or movie theater, you can exercise your power as a consumer not to give them any more business. But the connection between occupational licensing and quality of service can also be examined more systematically. These rules about what services need an occupational license vary considerably across states. In practical terms, this variation across states is part of what helps licensing to restrict competition from those in other states: indeed, Michelle Obama has advocated policy changes so that states would recognize certain out-of-state licenses held by military spouses. In research terms, the variation across states has allowed a wave of studies to confirm that occupational licensing is often quite effective at raising prices, but the quality benefits are often difficult to find in the data. benefits justify total antitrust immunity for licensing." Copyright protection has lost touch with its intended purpose. Derek Khanna lays out some striking evidence in "Guarding Against Abuse: Restoring Constitutional Copyright," published as R Street Policy Study No. 20 (April 2014). Here's the purpose of copyright according to the U.S. Supreme Court (Feist Publications Inc. vs. Rural Telephone Service Co., 499 US 340 , citations omitted): "It may seem unfair that much of the fruit of the compiler's labor may be used by others without compensation. As Justice Brennan has correctly observed, however, this is not "some unforeseen byproduct of a statutory scheme." . . . It is, rather, "the essence of copyright" . . . and a constitutional requirement. The primary objective of copyright is not to reward the labor of authors, but "[t]o promote the Progress of Science and useful Arts." Art. I, § 8, cl. 8. . . .To this end, copyright assures authors the right to their original expression, but encourages others to build freely upon the ideas and information conveyed by a work." Just to be clear, the quoted passage about "the Progress of Science and useful Arts" is from Art. I, § 8, cl. 8 of the U.S. Constitution. That original U.S. statute created a 14-year term, with the option of a 14-year extension if the author was still alive. Until 1976, the average copyright term was 32.2 years. Today, the U.S. copyright term is the life of the author, plus 70 years. By contrast, patent terms have changed very little. Today’s term for utility patents is either 17 years from patent issuance or 20 years from patent filing, whichever is longer. (The term for design patents, which resemble copyrights in some key respects, is still the original 14 years.) As legal historian Edward Walterscheid puts it, while patents and copyrights were included in the same clause of the Constitution and originally had the same or similar durations, the patent term has increased by just 43 percent while the copyright term has increased by almost 580 percent. Congress must justify why a 20-year term can provide sufficient incentive to inventors, but not to writers and artists. There's a lot of history and law about why this has happened: for even more detail than this article, you can look at Khanna's articles in the Cardozo Arts and Entertainment Law Journal here and here. Here, I just want to focus on the some of the peculiar results from this large and fairly recent extension of copyright--basically, a lot of stuff that would have gone off copyright in the last few decades is now still covered, and trying to figure out what is still covered by copyright from a few decades back can be quite difficult. Here are some examples lifted from Khanna's essay (with footnotes omitted for readability). "As one clear illustration of the costs of extremely long copyright, Warner/Chappell claims a copyright to “Happy Birthday to You,” which the Guinness World Records book calls the most famous song in the English language. Due to the copyright claim, every time someone wants to use a portion of this song in a video or performance, they have to pay a license fee or risk being sued. The Warner/Chappell claim is based upon a published version of piano arrangements from 1935. The authenticity of the claim is under dispute, with some arguing that the song was written earlier and by someone else. 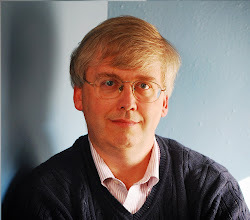 Robert Brauneis of George Washington University Law School has argued pretty persuasively that Warner/Chappel does not own a lawful copyright to this song. But while the court tries to sort this out, people will have to pay rents to Warner/Chappel to publicly perform the most famous song in the English language. This discourages some people from performing this song publicly. Restaurants such as Applebee’s and Shoney’s have developed songs that are used instead of “Happy Birthday to You” to avoid copyright infringement and avoid paying hefty royalties. . . .So far, they have collected an estimated more than $2 million annually in licensing fees for the song. According to one estimate, it is the song that earns the highest royalty rates. Under current law, “Happy Birthday to You” will remain under copyright until 2030, but we should expect a push to continue to expand copyright even further beyond 2030." How many plays from the 1920s, 1930s and 1940s have high schools had to pay large fees to license and reproduce? Certainly those plays are not too old for literary and cultural value. Under a shorter copyright term, as the founders intended, written music from that era would be available to anyone for free with the click of a button, rendering most of the early jazz movement in the public domain. Would schools not be more likely to have jazz clubs for students if most of the music could be printed for free? . . . A number of orchestras have stopped performing Peter and the Wolf, by Prokofiev, because when the work returned to copyright protection after having been in the public domain, the cost of sheet music became prohibitive. In a survey by the Conductors Guild, 83 percent of orchestral conductors have a general practice of conserving resources by limiting their performances and recordings of copyrighted works. About 70 percent said they are no longer able to perform some works previously in the public domain . . ."
When books enter the public domain, there is an explosion in readership and availability, because public domain works can be provided for free online. In fact, works are significantly more available once they enter the public domain. 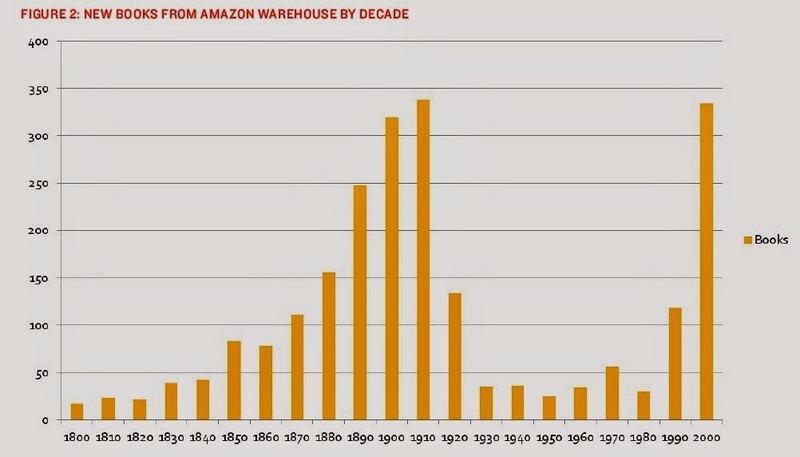 A 2012 review of books sold through Amazon showed that those published after the critical public domain cut-off date of 1923 are available at a dramatically lower rate than books from the prior century. This is what The Atlantic magazine has referred to as “The Missing 20th Century.” The spike in availability starts right after works enter the public domain. This study shows there are 700 percent more books available from the 1910s than from the 1950s, even though there were many more books published in the 1950s. Another study by the same economist showed that, when books enter the public domain, audio versions of those works become significantly more available and are of equal quality to those of copyrighted books. These examples can be multiplied, but I hope the basic lesson is clear. Excessively long copyright terms are not serving the purpose of promoting the arts, but have become a trough where lawyers, big corporations, and political interests joust and feed. Those who hold copyrights for successful older materials would of course like to see those copyrights extended. This no surprise, of course. I'm sure that those who hold patents on, say, successful prescription drugs would like to see the patents extended, too. But it is, of course, wild ironic that the Disney Company manages to lobby for continual extensions of copyright to keep exclusive rights to Mickey Mouse and others--when so many the classic movies of that the company produced were based on works in the public domain: for example, Snow White, Sleeping Beauty, the music in Fantasia, Jungle Book, Pinocchio, Aladdin, Beauty and the Beast, Alice in Wonderland, Swiss Family Robinson,and many more. And just in case you think this is over? Khanna points out that the forces arguing for ever-longer copyright have inserted a provision in the drafts of the trade agreement called the Trans-Pacific Partnership Treaty which would extend copyright to life of the author plus 100 years--and by making this part of an international agreement, it would then become much more difficult for Congress to alter it in the future.